Gamers clearly enjoy role playing as pirates. The sea shanties, sailing the open seas, the thrill of adventure and the sense of being lawless add up to a rather exciting scenario. There have been a few good games recently that capitalized on this setting, most notably the Assassin’s Creed franchise. 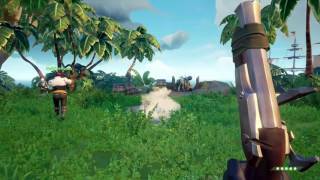 Microsoft has been working in collaboration with developers at Rare to create their own vision of these high seas criminals, in the Sea of Thieves. 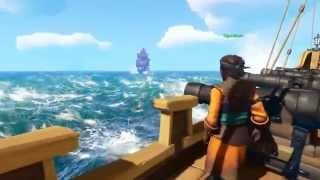 This action adventure title hopes to bring players together for some light hearted naval adventures, and we got a chance to play a bit of the game at E3 2017. Sea of Thieves is billed as an open world adventure, with cooperative multiplayer taking the center stage. In our demo, me and four others were instructed to set out in search of adventure and treasure, located on a distant island. We spawned on shore and made our way to the ship that was waiting. In voice chat, pirate jokes and impressions began shortly after. Exploring our ship, it had a cargo hold, captain quarters, and a few interactive items. We manually raised the anchor, and let the sails loose and started on our way. Players need to approach the sides of the ship where the sails are tied in order to release them, and also to adjust the angle to match the wind (indicated by a stylistic effect). 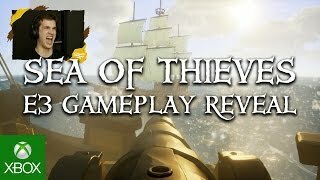 As far as basics of sailing are concerned, Sea of Thieves does well, striking a good balance between accessibility and need for teamwork. And you certainly need teamwork. With all sails down, the captain at the helm steering the ship cannot see straight ahead, so he must rely on the crew to guide him around obstacles. We were not all paying attention (and cracking too many jokes) to notice the quickly approaching rocks. We grazed them, but came away relatively unscathed. Carrying on, we used the map in the cabin in order to navigate around the quite large area and provide directions to our captain to adjust the course. However, after putting down the map, I realized I was standing in a large pool of water. It turns out our earlier encounter with the rocks put a hole in our hull, and we were going down. That’s right, just minutes after leaving port, we watched our ship go down to the depths. Funny as it was. After a few moments, a mermaid with a beacon appears, letting us respawn and with a new ship. We work together better this time, plotting the course and ensuring to steer clear of rocks. Sailing does take a little bit of time, so we pretend to be a real crew and try to learn what side starboard is. As we approach our target island, we see another ship sailing away nearby. Rather than go for a quest to get some measly gold, we decide instead to give chase to this ship. While we tried to catch up, I had a quick look at the inventory wheel where I had a shovel, a lantern, and yes, a banana. And in my weapon selection, at my disposal was a sword, a pistol, and a heavier rifle. To prepare for what was to come, I went down below the deck and grabbed some cannonballs from storage. You can only carry 5 at a time, and using the cannons is a fully manual process – you load them, and fire. It’s a resource-based mechanic, no unlimited ammo here, helping the game stay balanced and forcing you to make your shots count. As we finally caught up to the ship, I manually dimmed the lanterns on ours to pretend we are being stealthy, as night has fallen. Our stealth didn’t really work though, and we came under fire from the other vessel. We tried to tell our captain how to maneuver the ship to give us a chance to return fire, but his skills were not up to par. So instead, we were close enough to jump into the water and swim over. The other crew were definitely not expecting this, and we shot them on their own deck. This crew was carrying treasure, so our efforts felt instantly rewarded. But there was a twist to this successful plundering – a third sail appeared and engaged us. A few well placed shots eliminated our crew. When you’re dead, players enter this peculiar after-life location while you wait for the timer to respawn. You can walk around the ship and witness the enemy board and steal the treasure that we barely had time to enjoy. They also sunk this vessel, leaving us stranded, and we watched as our own captain sailed away to escape combat. That’s where our demo came to an end. To be honest, up until now there wasn’t much about Sea of Pirates that appealed to me personally, ever since the game’s announcement. But after playing the demo – whether it is because I misjudged the game, or I was lucky enough to get a near-perfect natural experience that the developers are aiming for – it did click for me. The art style may put some players off, and the focus on cooperative multiplayer is not everyone’s cup of tea, but from what we’ve seen, there is definitely some potential here for lighthearted and fun group exploration adventures. Sea of Thieves is coming exclusively to Windows 10 and Xbox One in 2018.